Yesterday both Infinity Ward and DICE - the developers of two rival multiplayer shooters - decided to release the updates for their products. Call of Duty: Ghosts got the patches for PC, PS3 and PS4 versions, and Battlefield 4 now looks better on PlayStation 4. The main advantage of the new Call of Duty: Ghosts update for the PC version of the game includes the support of two Nvidia technologies - PhysX and Apex. 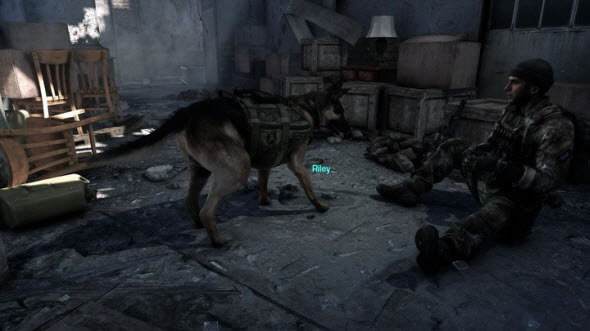 The latter one improves the fur of all dogs in the game allowing it to respond to any changes in the shooter's environment. Although it is Nvidia's technology, you will be able to enjoy it even on your PC with AMD GPU. PhysX improves other details in the game's graphics, but it is available only for the owners of the Nvidia's graphics cards. Also the developers have made lots of fixes and improved the stability of Call of Duty: Ghosts game. To see all fixes and changes, visit the official game's community. Battlefield 4 game got the exclusive update for the PS4 version of the game. With this patch you won't experience the crashes, when you change weapon or map and resume the single player mission. Also the developers have fixed bugs with PlayStation Plus subscription and save files. The last improvement touches the performance during the destruction of Levolution objects. Also DICE has published new Battlefield 4 video - the TV ad about Second Assault DLC. We would like to remind you that this add-on was released last week, but for now is available only for Xbox One owners with BF4 Premium Membership. Next week all others will be able to play Battlefield 4 Second Assault DLC on their PC, Xbox 360, PS3 and PS4.